Anti-clogged: Good Grips Silicone Sink Strainer. 2.5mm dia petal holes. Efficient anti-clogging shield lets water flow seamlessly into the drain while debris catch, effectively stopper to vegetables,food particles and other kitchen debris, trash go to drain pipe. Stable: 30g weight, stable ,will not slip around the drain. It can well stay anchored to the drain,even though you pour a large amount of water into the sink. Easy to Clean: TPR resin material,non staining oil stains,easy wash with warm soapy water to keep color over time. Exquisite appearance design: colorful flower shaped edge decorate your kitchen and light your sink. TIRED OF CLOGGED SINK STRAINERS? 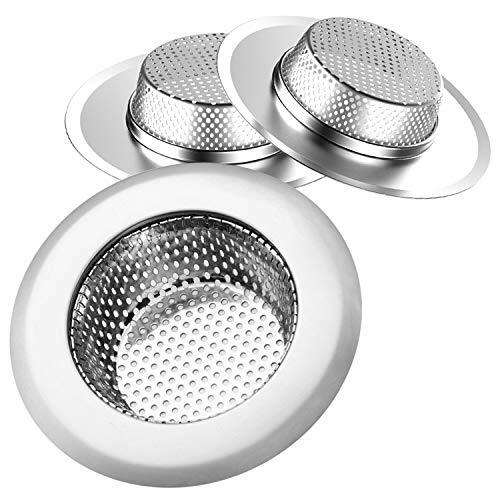 - Most sink strainers have 1mm or smaller drain holes which end up clogging the sink. Solid's sink strainer has 2mm diameter holes to let fine particles pass through. This means no more fishing around dirty water with your hands to unclog the drain. SAVE TIME DOING DISHES - Avoid fumbling around a pool of dirty water trying to unclog the drain hole with your hands. Wash with warm soapy water to keep the impeccable mirror finish shine over time. Dishwasher safe. AVOID CALLING THE PLUMBER - Protect your pipes from damage or clogged sinks by catching any large food particles or eating utensils that get stuck in the drain. HIGH QUALITY MATERIAL - While most competitors use 201 stainless steel (which corrodes, rusts and stains your sink), Solid strainers are made with 304 stainless steel resistant to rust and corrosion. The 2.75 perforated bowl is contoured by a 2-ply metal rim to rest over sink's drain. Danco is one of the largest plumbing repair, replacement, and remodel suppliers in the home improvement industry focused largely on empowering 'Do-It-Yourself' consumers with plumbing solutions that are as practical as they are affordable, giving your home a more fresh appeal and renewed elegance. We provide stylish design-oriented innovative home solutions that are user-friendly to support and encourage customers to tackle home improvement tasks on their own - without the heavy price tag of professional services. The Danco 1-3/4 in. Sink Hole Cover is used to cover unsightly holes in the sink when the spray head or soap dispenser is not in use. It features a 3 inch long threaded shank design that require no tools to install. The universal design will fit most standard size sinks holes. The stylish chrome finish will complement your existing fixtures. The durable plastic construction is resistant to rust providing a long lasting performance. Order yours today! DIMENSIONS: 3-inch long shank x 1-3/4 inch outer diameter flange. Threaded 1/2 inch shank design. 3 in. long shank x 1-3/4 in. O.D. Ideal for sink drains and garbage disposals. 2mm dia holes, Efficient anti-clogging shield lets liquid flow seamlessly into the drain while it blocks food particles. Set of 2- Large Kitchen sink strainers made of heavy duty & durable stainless steel. Perfect for daily utilitarian use for long-lasting protection against clogging. MONEY BACK GUARANTEE: We think you're going to love this Sink Strainer as much as we do! But in case you don't, you are covered by our 30 days, no questions asked, money back guarantee. We want our customers to be 100% happy. 3-1/2-inch kitchen sink drain - make you good mood in the kitchen cook daily, you will know the importance of kitchen sink drainers. If the sink is blocked by debris, leaking too slow or difficult to clean up debris, It will affect your mood. This is very troublesome, bad mood affect your cooking skills, even strike. KONE kitchen sink drain strainer is a good choice. help you resolve the trouble. KONE composite drain assembly features: sus304 stainless steel, rust-free/ non recycled pp plastics multilayer structure to ensure the seal, no leakage Easy to install and convenient package includes sink drain, basket strainer, cover stopper. As we all know the importance of kitchen sink drainers, If the sink is blocked by debris, leaking too slow or difficult to clean up debris, It will affect your mood.This is very troublesome, bad mood affect your cooking skills, even strike. Now I will help you resolve the trouble. 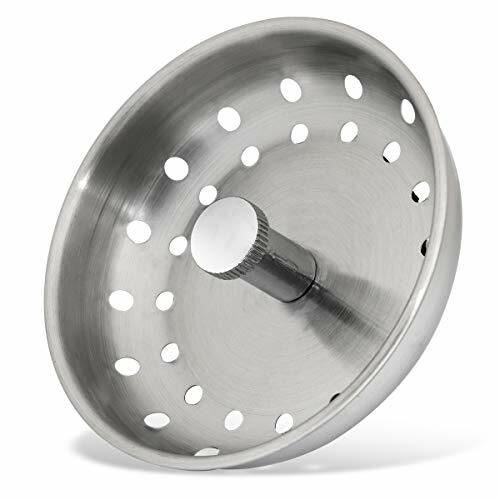 KONE 3-1/2-inch Kitchen Sink strainer is made of durable stainless steel and a rubber stopper, keep drains clog free and great for all standard kitchen sink drains. Works as strainer or stopper can be switch freely. Designed with a stylish look to make your kitchen look beautiful. 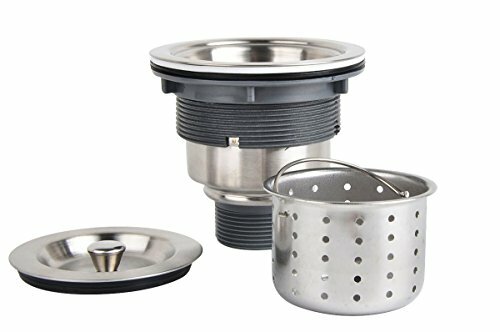 The KONE Standard Kitchen Sink Strainer will fit Kohler, Moen, Delta, Elkay, Blanco, Glacier Bay, Danco, Pfister, and every other standard U.S. standard kitchen sink (3.5"-4" opening). FIT STANDARD SINK: Widely universal fits most USA 3-1/2 inch kitchen sink or old sink, it is PERFECT replacement. PLATINUM MATERIAL: 304 Brushed stainless steel body durable and antirust, Metal center knob longer life, Rubber stopper stop the water seeping out. GARBAGE STRAINER: Good filter hole design, Caught most of the food waste while ensuring rapid drainage and easy to clean. EXACTLY WHAT YOU NEEDED: It able to act as a filter or drain plug, easy to stop the flow of water and open back up. WINONLY kitchen sink strainer are the wise choice of many hostess. 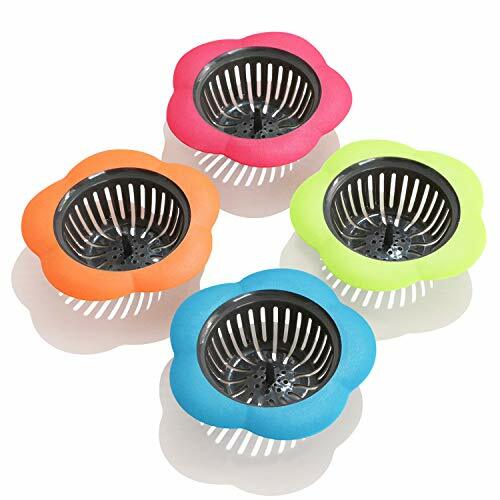 First, WINONLY kitchen sink strainer are 4 pack set, only cost $2.49per piece. Secondly, the rim of the strainer has been made of stain and rust resistant stainless steel. The two-ply metal thickened edge, so it would not scratch or damage your sink and hands. 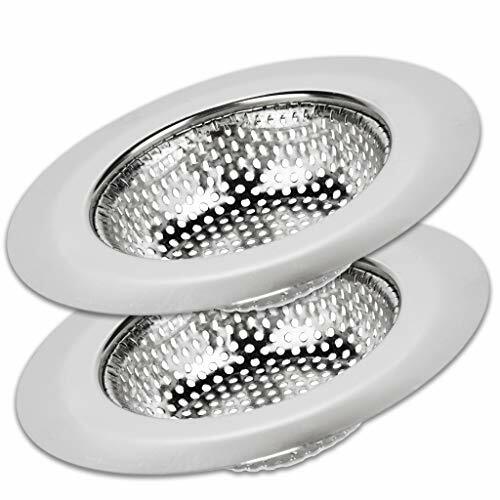 Compared with other similar kitchen sink strainer, it is an cost-effective choice. 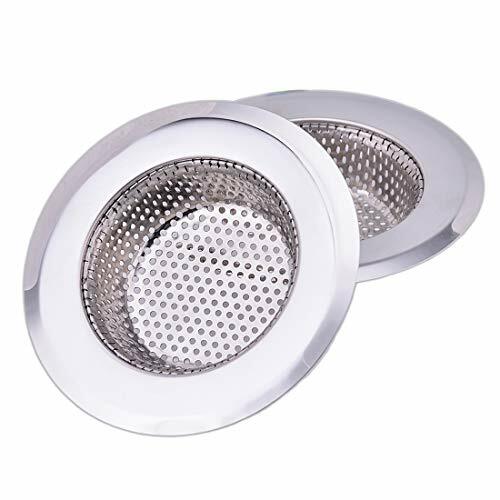 Drain filter strainer can be used in kitchens, bathrooms, fish tanks, shower rooms, washrooms, toilets, wash basins, etc. Effectively prevent foreign matter such as hair, paper scraps, food debris, fabrics, etc. from entering the drain pipe, and bid farewell to the original cleaning method of cleaning the pipe with tweezers. Protect the sink, floor drain, etc., sink filter debris, hair, etc. Effectively prevents hair, paper scraps, sundries, food debris, fabrics and any other rubbish from entering the sink drain. Easy to use, as you simply place a strainer over the kitchen drain strainer, let it catch all the unwanted food waste. Then clean it out by tapping the food waste out it over a trash bin. Then it's time rinse it out and put it back into place in the sink drain. Easy to clean and dishwasher safe. Don't use it if you found sharp edges in sink strainer, contact us for full refund. 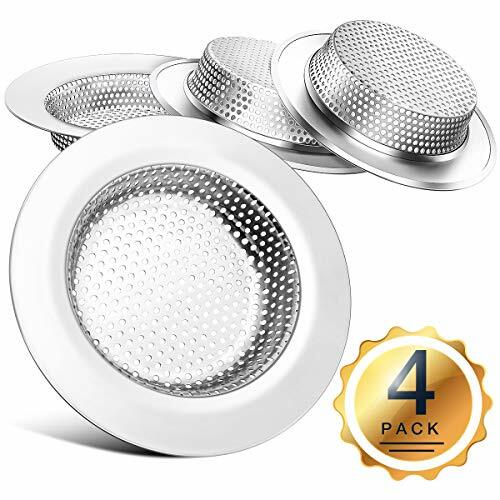  Cost-effective $2.49/Piece WINONLY kitchen sink strainer are 4 pack set,only cost $2.49 per piece.It the wise choice of many hostess. 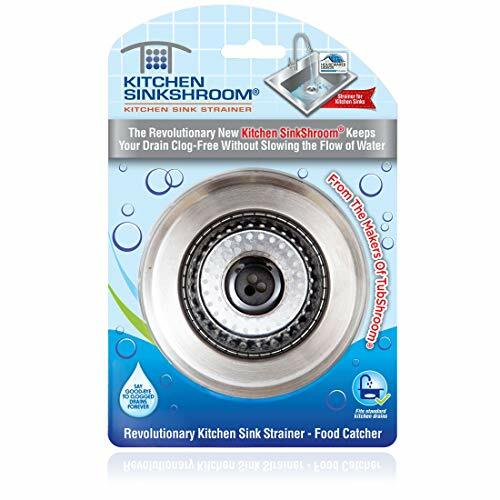 Kitchen sink drain strainer fits most sink drains and garbage disposals.Outer diameter: 4.5''; inner filter: 3.15''; depth: 0.9''; micro-perforation diameter: 0.08''.Fits 3-3.7'' drain opening suitable for most American families kitchen sink. 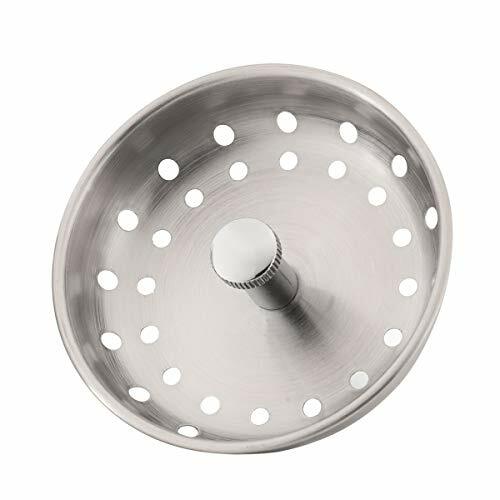  Thoughtfully Designed The rim of the strainer has been made of stain and rust resistant stainless steel. 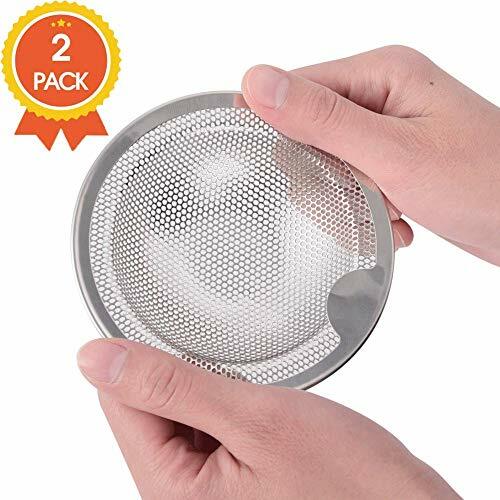 The two-ply metal thickened edge,so it would not scratch or damage your sink and hands.WINONLY sink strainer basket which has micro-perforations only 2mm.Sink filter helping you to filter out even the tiniest food scraps and preventing any blockage in the pipe. 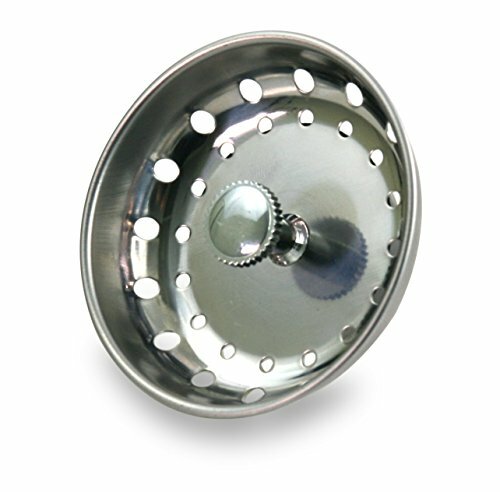  Durable Long Lasting WINONLY sink strainer comes with a beautiful High standard polishing finish. The rim of the strainer has been made of stain and rust resistant stainless steel. The tough build makes it durable. Sink strainer stainless steel not bend easily and are sturdy so they would not break even under strong water pressure. 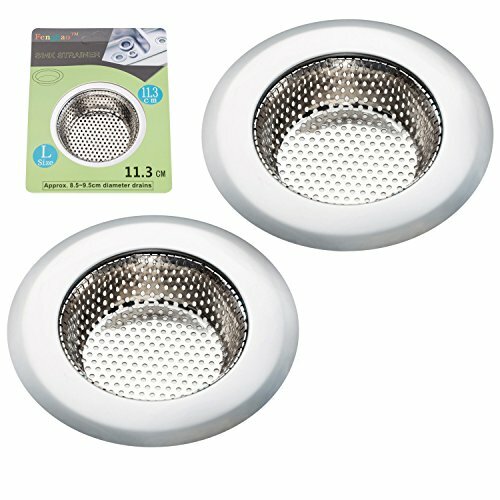  Easy To Fit and Clean This lightweight yet sturdy pair of sink drain strainers goes with the motto food out, water in, and does exactly that very efficiently. WINONLY drain strainer is easy to install and clean.The basket design allows more water to pass through while efficiently catching all the garbage so that it does not clog the sink system.It can also rescue jewelry--like rings and bracelets -- that is removed during food preparation.  100% Satisfaction Guarantee If you don't love your fitted stainless steel bathroom sink drain strainer, return it anytime for a 100% no hassle refund. With that no risk guarantee simply add one to your cart now.WINONLY sink drain for garbage disposals is also a very inexpensive& thoughtful gift for any friends or family members who are moving into a new house! Easy to use, as you simply place a strainer over the sink drain, let it catch all the unwanted food waste. 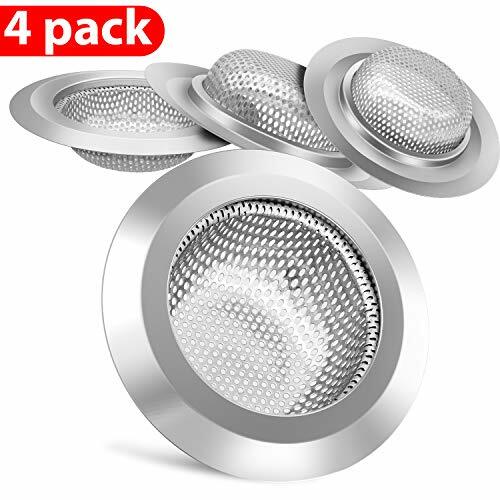 Super Value Set: Our mesh sink strainer are 4 pack set and each stainless steel sink screen is about 4.5'' x 4.5'', and it's inner filter is 2.8'', depth is 0.98'', micro-perforation diameter is 0.08''. Made of Stainless Steel Material Practical and Durable: Our kitchen sink strainer is made of stainless steel, not dull or corrode, and keep their mirror-like shine. It is suitable for daily utilitarian use for long-lasting protection against clogging. High Performance&easy to Use: Our stainless steel kitchen sink drain strainer will not obstructing the flow of water, make your sink more easier to clean. Just remove the basket to empty, no need to install sophisticated systems for sink drain! Dishwasher safe. WONDERFUL GIFT FOR FAMILY:Our kitchen sink drains have perforated or sink filter baskets and are a very intimate and inexpensive gift for any friend or family member who moves into a new house! NO HASSLE MONEY BACK GUARANTEE:We know you'll love our sink strainer as much as we do, if for any reason you're not 100% SATISFIED, let us know and our customer service team will make things right: full refund or a free replacement, whichever you prefer. KEY Feathure Replacement basket strainer prevents debris from clogging drain pipe Stainless steel body durable and antirust Fits most 3 1/2 inch standard drains Metal center knob longer life than plastic Works as basket strainer or drain plug This Standard Kitchen Sink Strainer will fit Kohler, Moen, Delta, Elkay, Blanco, Glacier Bay, Danco, Pfister, and every other standard U.S. standard kitchen sink 3.5" drain. Quality & Service Guarantee We guaranty 100% satisfaction and no-hassle return of lifetime for all products. If you have any questions, please contact us via Amazon, and we promise response within 24 hours. We are confident you will be very happy with our products. Click the yellow button to add this product to your shopping cart, don't miss the opportunity of the worry-free purchase. GOOD FOR STANDARD DRAINS: Widely universal fits most USA 3-1/2 inch kitchen sink or old sink.Easy to Install and use. GOOD QUALITY: Sink basket strainer was all metal and not a cheap plastic knock off. 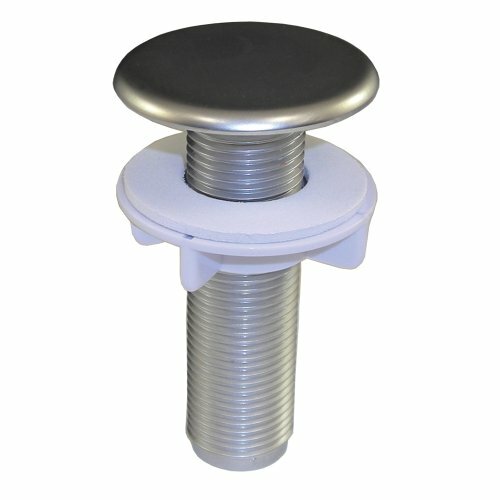 Metal Center Knob more durable. HOLD WATER: Rubber stopper seals well to keep water in the sink for washing dishes. No leak and last a very long time. EASY TO CLEAN: Remove the basket to empty, wash with warm soapy water to keep the shiny finish. Dishwasher Safe. Do you worry about the clogging of your kitchen sink? Are you tired of constantly replacing weak, inefficient sedimentation filters? Our sink strainer is your ultimate solution! With our strainer, you can save both time and money! The upgrade handle of our strainer makes dumping out food residue so much easier, no longer have to worry about strainer stuck in the sink. Unlike wire mesh strainer was difficult to clean out and restrict the flow of water. Qtimal drain strainer is easy to clean and anti-clogging. Simply dump the chunks then give them a quick rinse and wipe under running water to get them completely clean and shiny. Perforation 1.5mm dia holes on entire basket instead of screen ensure water go through seamlessly and avoid the strainer itself clogged by particles and other debris. Did you know that the cost to unclog a drain is anywhere between $54-$500? (Depending upon where you live) With the National Average being $195? Averagely distributed perforation 1.5mm dia holes on surrounding wall and bottom of the basket allows more water to pass through while efficiently catching all the garbage so that it does not clog the sink system. Our sink strainer can easily and effectively prevent hair, paper dust, food debris, fabric, etc. from entering the drain. While most competitors use 201 stainless steel (which corrodes, rusts and stains your sink), Qtimal strainers are made with 304 stainless steel resistant to rust and corrosion. No sharp edges on the drain strainer, so it would not scratch or damage your sink and hands.